This might as well be called “Top 2013 Albums My Roommates Are Tired Of Hearing” because I wore most of these out this year. 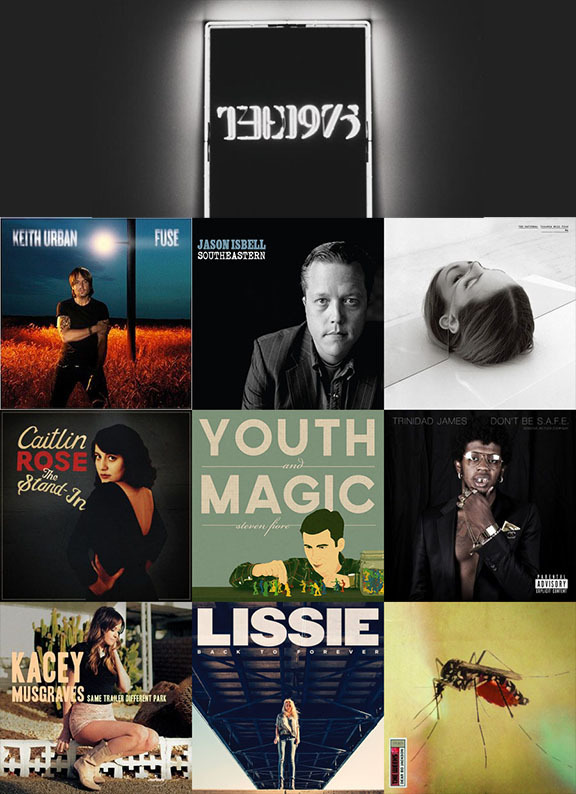 Below are a handful of records I really enjoyed in 2013, in no particular order (except for The 1975). NUMBER ONE. Spotify and my turntable will testify to the borderline crazy amount of times I listened to this band this year. At one point I reached One Direction level fan-dom with them, but thankfully came down from that high. Many complain that they can’t understand what this band is singing about… uh I grew up in the deep South and know exactly what these Brits are saying. Their loss. This record was the soundtrack to my summer and beyond. The album art is HORRIBLE, but this is a solid country record from front to back. Fuse hasn't left my car's CD player since I got it. Keith Urban is an incredibly talented musician and picked some great songs for this album. He even dragged Eric Church out from the rock he was living under! Urban has released "We Were Us" (F/ Miranda Lambert) and "A Little Bit Of Everything" to country radio and I'm praying that "Cop Car" is next. When I first listened to this record, "Super 8" was my favorite. It's also the one track that sticks out like a sore thumb. As I lived with it more, I fell in love with the rest of it. Isbell carefully strung together songs about lonely hearts, weary travelers and raucous partying on this album. I can (occasionally) identify with all of that. I also sang it's praises to just about everyone who would listen to me this past year. I call this mumble rock. Sometimes you just want to listen to a record that is both relatable and depressing at the same time. This is it. Caitlin Rose is one of those girls that makes me take a step back and reconsider what I'm doing with my life. We're the same age, yet she's writing phenomenally relatable songs (WITH PEDAL STEEL!) about our generation and I'm… uh… working 3 jobs and going to as many shows as I can? This album rules, and so does she. This is the album you want to listen to if you want to have all the feelings. Steven’s an incredible songwriter and I was fortunate to see him play some intimate house shows in Nashville this year. It’s always nice to see a fellow Charleston kid do well, and boy did he knock it out of the park with this record. I won’t lie. The first time I heard “All Gold Everything” I didn’t believe it was a real song. I thought that Nashville’s rap station was playing a joke on us. (I think they thought they were too…) This record is ridiculous, and at many times it doesn’t seem as if he’s going to catch up to the beat. Sometimes there aren’t any hooks. That’s fine. It’s Trinidad James. Let him do this thing. Sure, Miranda Lambert cut her song “Mama’s Broken Heart”, but Kacey has a sass all her own. Plus, she wrote the ultimate twenty-something girl anthem with "It Is What It Is". The first time I heard her play that song, at some random writers round one night, it stuck with me. Country music needs more women, and I'm glad she's representing my generation right now. I liked this album, but I can’t wait to see what she brings on her follow up. I feel like the major label debut may have held her back a bit. I see Lissie as Stevie Nicks’ younger sister and I love it. Though they are often compared, it’s still a high compliment. I was familiar with Lissie’s music before, but it was my roommate Kelsey who really got me into this album. "Further Away" could be a newer Fleetwood Mac cut. "Shameless" says everything you need it to. She also made it on the sad playlist with “They All Want You”. First off, The Weeks named this album after the greatest athlete of all time (of…all…time…). THEN they made sure it was full of songs that wouldn’t disappoint. I've been a fan of these boys for a while, but 2013 was their year. Southern "Rock" at it's finest. yes yes y’all. I rarely ever say this, but I should’ve listened to Mel Washington sooner. No, classy girls don’t kiss in bars you fool. I listened to this record a LOT this year, no shame. Took long enough. I love these kids. My only complaint is that they’re touring so much I barely get to see them around town anymore. I wanted a sad record, I got a sad record. Apologies is simple and beautiful. “Stick Around” is gut-wrenching and scarily relatable. Saw him play to an incredibly quiet yet packed 12th and Porter this Fall. You could’ve heard a pin drop in there, he had everyone’s undivided attention. Glad to see this guy getting some love outside of Austin. This is the album I wanted but didn’t know I wanted. By a band I’d only heard a little bit of before. My turntable saw a lot of this camo green record this year. When I grow up, I want to be even just half as badass at Cary Ann Hearst. I pulled a reverse Cary Ann… grew up in Charleston and then moved to Nashville. “Kemba Got The Cabbage Moth Blues” is my favorite track and I hit repeat at least 2x every time. If you haven’t seen them live (shame on you, they’re road dogs) – DO IT NOW. 3. Blak and Blu – Gary Clark Jr.
A friend told me about this guy this summer. Come to find out, several of my friends had been keeping him a secret from me. (Like how my roommate spent one night sharing cheese fries with him.) I got sucked in and I love it. I’d like to marry some of his guitar tones. The record store day issue of this vinyl is also a masterpiece. I’ve always kind of liked JTE and seen him play around Nashville a good bit but it wasn’t until this album that I was fully on board. 1. Some Nights – Fun. This record WAS 2012 for me. I remember being in NYC December of 2011 and hearing “One Foot” as the follow up to “We Are Young” — just knowing that this album was going to be huge. When it was available for streaming, I couldn’t get past the title track, I just kept hitting repeat. I got mad at the auto-tune. I fell in love with the auto-tune. The bonus track “Out On The Town” became my favorite. I flew to NYC on a day’s notice to experience their 2 night SOLD OUT stand at Terminal 5 this summer. Honestly, I’d pay to hear Nate Ruess sing the phonebook, but he always delivers way more.